Some great books hit your life like a sledgehammer. They wreck your preconceptions and disrupt what you were sure you knew. We need these books from time to time. Other books come like a cool drink of water on a hot afternoon. They reaffirm what you thought you knew, and shore up your pre-existing convictions. We need these ones, too. 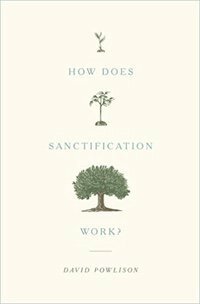 David Powlison’s new How Does Sanctification Work? was decidedly in the second group for me. It is a book about one of my favorite topics and written by an author whose work has been important in my life. It was just the book I wanted and needed to read in the moment I picked it up. Sanctification is a topic that has received a lot of attention over the past few years. We have grown accustomed to hearing of the centrality of the gospel in sanctification. And, of course, it is exactly the case that the gospel goes far beyond our justification, and is, indeed, essential to our sanctification. Yet, as is so often the case, people may have taken this a bit too far. Suddenly the cure for every ill was “look to the gospel” or “be gospel-centered.” Some went so far as to promote a kind of “hypergrace” that insists sanctification can be had in no other way than meditating upon the gospel and applying its promises. It said something like, “You are sanctified by remembering and believing afresh that you are justified by what Jesus did on the cross for you.” Everything else was given the ugly label of “legalism.” And it is in just this context that Powlison prepared his book. What Powlison wants and promotes is a well-balanced understanding of sanctification that accounts for the many and varied means God uses to make his people holy. Faith in the gospel is the foundation for all sanctification and meditation upon the gospel is one means of gaining it. But it is not the only one. Rather, God has given us many and varied means and different ones will apply to different people at different times in their lives. The means God uses for me today, may be very different from what he uses for you tomorrow. This emphasis makes How Does Sanctification Work? a book perfectly suited to this point in church history. It addresses and resolves one of the key points of confusion in the church today. Yet its principles are timeless, making it a book well-suited to any other point in church history. I enthusiastically recommend it.